According to the National Survey on Drug Use and Health more than a million Americans abuse methamphetamine in a single year. 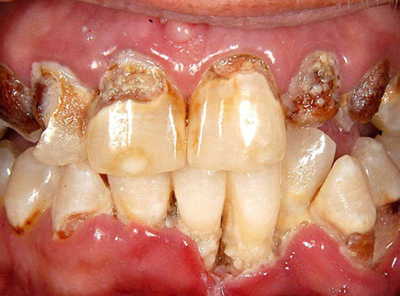 The destructive physical effects of meth are devastating to teeth and gums. Meth causes vomiting, which creates acid in the mouth; diarrhea, which dehydrates the body; and craving for sugar and junk food, which promotes further acid in the mouth. All of these factors contribute to a dry mouth, rob teeth of nutrients, and make the mouth a breeding ground for bacteria, plaque, and rapid tooth decay. Some reports also attribute tooth decay to corrosion caused by chemicals in the drug. When ingested, meth causes blood vessels to shrink, which decreases the blood supply in your mouth. The result is oral tissue that decays. Jawbone and gum tissue become too weak to support your teeth. As teeth rot and gum tissue and bone are destroyed, tooth loss is rampant. The picture on this page shows how devastating meth use can be. The degree of tooth loss does not necessarily coincide with how long a person has been using meth. In as few as four months, some users have teeth that have rotted to the roots. The picture on this page shows how damaging meth can be on teeth. While meth is still in use, teeth can be minimally protected with fluoride treatments. Patients should be encouraged to drink lots of water. But most importantly, professionally help is needed to help control the addiction. If a meth patient recovers, a skilled cosmetic dentist can make recommendations to prove natural-looking restorations for the patient’s teeth. Depending on the condition of the teeth, dental crowns or dental implants can be used to restore them. An attractive smile can go a long way to make the patient feel renewed.